ITT Pro’s technology allows us to make any machine a smart machine, including pumps, gearboxes, and motors. ITT Pro has more than 160 years of experience with process pump control systems, so we work with ITT Pro to help solve problems with process uptime, maintenance, and energy costs in your plant to improve profitability. The ITT Pro monitoring products help you make the time critical equipment decisions before there are issues. Unplanned machine failures can cost 10 times more than planned maintenance. Pump control systems can scan multiple machines at once, so you can focus on results analysis and troubleshooting. There are 2 primary product lines, i-Alert2 and PumpSmart. Used to record critical data like tri-axial vibration, tria-axial kurtosis, temperature, and run-time hours at all times – 24/7/365. The sensor checks every five minutes, and alarms are set off whenever equipment is operating outside accepted operating conditions. Features simple installation. The sensor can either be attached to a machine with epoxy and a mounting adapter, attached magnetically, or bolted to the machine. Under normal use, its battery power can be expected to last 3-4 years. Reduces time needed for data collection. The i-ALERT app, available as a free download, allows users to easily monitor conditions on rotary equipment. 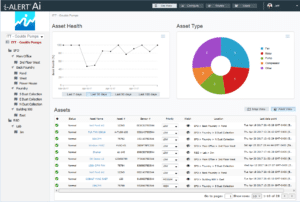 Wirelessly keep track of any i-Alert enabled devices on machines, all at a safe distance. Maintain data about conditions. 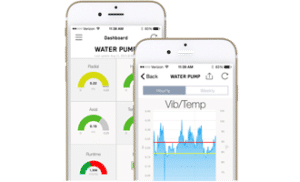 The app maintains records of trend vibration, temperature, and kurtosis data monitored once per hour (and on alarm) for up to 170 days. The weekly average, minimum, and maximum are stored up to 5 years. Diagnose machine faults by downloading tri-axial vibration spectrum data in the form of the Time Wave Form and Fast Fourier Transform data sets. Reference machine data while at the machine. By entering the serial number for ITT Goulds Pumps equipment, you can load a pump performance curve, repair parts list, and pump data sheet. Automate data collection. Select the machines, time, schedule, and type of route and follow the instructions on screen. It’s as easy as setting up a music playlist. Save time by having the i-ALERT app generate reports for you. 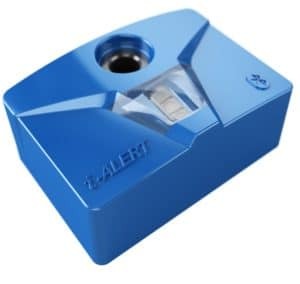 i-Alert AI allows you to manage and monitor of all your i-ALERT enabled sensors and machines in a single location. With this subscription service, no software or dedicated hardware is required. Track overall performance of every machine in your operation. Set up different sites, zones or areas to create performance comparisons. Avoid spending time correlating machine history from various data sources. View technical data, trend data, machine notes, and vibration spectrum data in one simple timeline. See vibration spectrum data in all three axis. Diagnose machine faults by using built in tools to analyze FFT (Fast Fourier Transform) and TWF (Time Waveform) data sets. Use the Routes Control Center to track on-time performance, and to visualize what routes are due at any given time. The Routes Control Center allows you to create, view, assign, and edit data collection. Pump Smart pump control systems provide valuable process insight and real-time control and protection of your pumps. We help keep your process running longer and eliminate unplanned repairs by protecting against unplanned pump failure related to process upsets. We can reduce both energy consumption and wear and tear on your process system by assisting to right size your pumps to your system. Contact us using the form on the right for pump control system quotes and assistance.